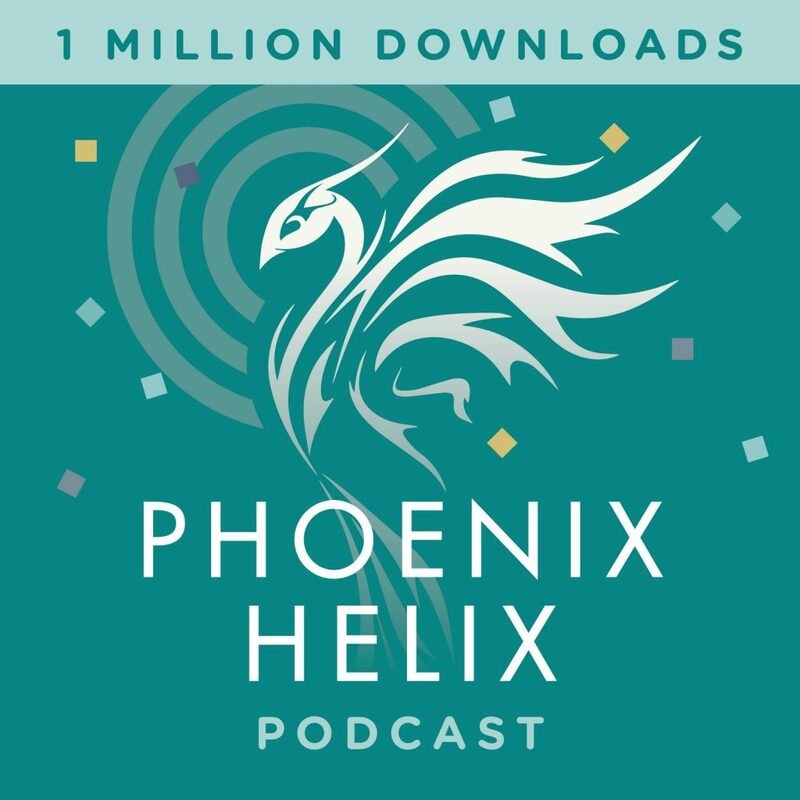 1 Million Podcast Downloads Celebration! 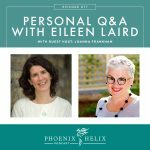 When I recorded my first episode back in 2014, it was the only paleo podcast focused 100% on autoimmune health. Now, there are three new ones hosted by my friends and fellow autoimmune warriors. Check 'em out: Autoimmune Wellness, Global Healing Protocols, and Unbound Healing. Update 2019: And here are two more! Emotional Autoimmunity and The Unskilled Cavewoman. It's actually very rare for any podcast to hit the million milestone, especially one like mine that has a niche audience and only airs once every 2 weeks. I'm incredibly honored, and I have you to thank! Without listeners, I would just be talking to myself. Autoimmune disease might be an epidemic, but so is learning to reclaim our health and rise above! Hosting a podcast is a ton of work, far more than most people would guess. I spend 15-20 hours on every episode. That includes research, preparing for the interview, recording the interview, editing, and writing up the detailed show notes for which I have become famous/notorious. The good news is that the work is also incredibly rewarding. If this podcast wasn't my passion, I would have stopped long ago. 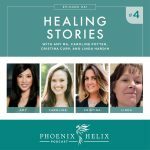 The most popular episode of all time is Healing Stories 4. 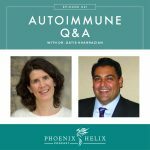 It's one of six such episodes that focuses on back-to-back interviews with people with autoimmune disease. Each shares their story of going from rock bottom, back to a full and beautiful life. This idea was one of the inspirations for my podcast. I was so tired of hearing the same guests featured over and over on health-related podcasts. While expert interviews can be educational and I include those in my schedule too, I believed that unfamous people sharing their real-life stories is what was missing. It turns out, you agree! I have hundreds of ideas for podcast topics and guests, enough for many more years of episodes to come. Thank you for joining me in these conversations! The winners were chosen with a random number generator. Congratulations to Laura Richens who won the USA giveaway, and Kerry Kaesehagen who won the international giveaway! If you didn't win, don't despair. All of the prizes are available for purchase. And I will always fill my blog and podcast with free inspiration, too. Thanks for being part of my healing community. Thank you all for making this milestone happen! Because I love all of my podcast listeners around the world, I have a USA Prize Package and an International Prize Package. These are some of my favorite resources. 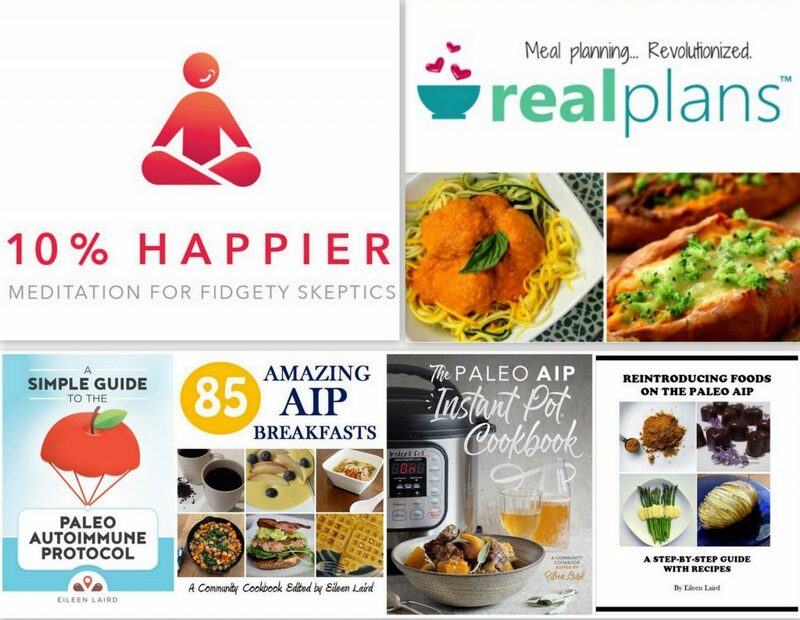 PDF versions of all 4 of my books: A Simple Guide to the Paleo Autoimmune Protocol, Reintroducing Foods on the AIP, 85 Amazing AIP Breakfasts, and The Paleo AIP Instant Pot Cookbook. 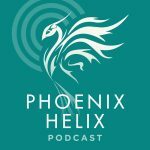 Paleo on the Go Phoenix Helix Pack: Paleo on the Go has been my long-time podcast sponsor. They sell gourmet-quality frozen meals, and this pack includes my hand-picked seasonal selections from their AIP menu: Original Shepherd's Pie, Pastured Chicken Bone Broth, Beef Breakfast Empanada, Turkey Tetrazzini, Elk Burger with Wild Mushrooms, Collard Greens with Smoky Bacon, Butternut Squash Bisque, and Lemon Dill Avocado Sauce. 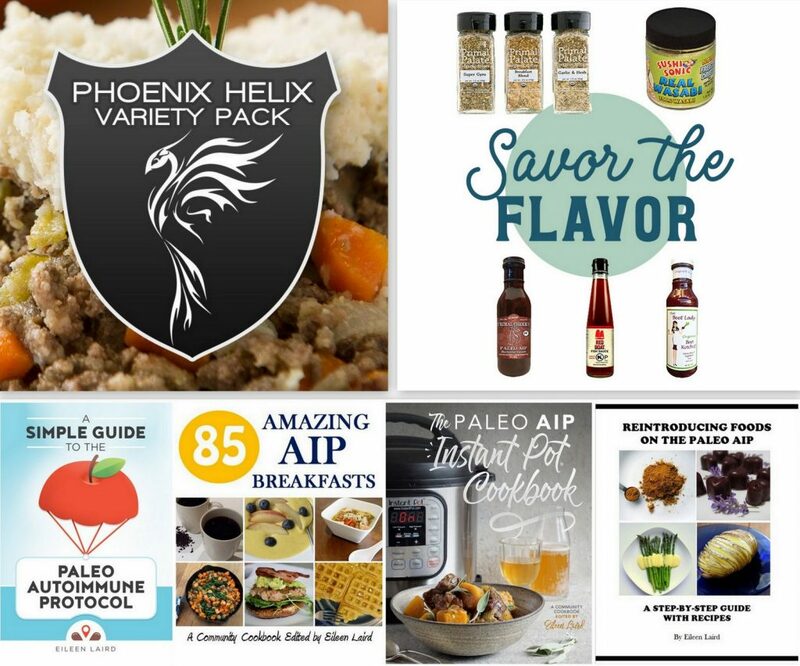 Shop AIP Savor the Flavor Pack: Shop AIP is my newest podcast sponsor. They are an online store, and everything they sell is allowed on the elimination phase of the paleo autoimmune protocol. Often, when you're new to the AIP and lose a lot of your favorite sauces and spices, it can feel like the flavor has been sucked out of your kitchen. This pack changes all of that. It includes: KC Natural Primal Cherry BBQ Sauce, Primal Palate AIP Seasoning Set, The Beet Lady Ketchup, Red Boat Fish Sauce, and Sushi Sonic 100% Wasabi. 1 year subscription to Real Plans Meal Planning Service: With over 150 AIP recipes to choose from, this program makes meal planning easy. When you first login, go to to “Settings” and select “My Diet”. Select the AIP meal plan, and it will automatically search for recipes that fit the protocol. But here’s where it gets fun! You can add extra restrictions if you have additional food sensitivities. And if you have successfully reintroduced some foods, like eggs or white rice, you can include those foods back into your search. It’s totally customizable to your dietary needs. 1 year subscription to 10% Happier Meditation App: One thing I stress on my podcast is that autoimmune health is about more than just food. Psychoneuroimmunology is the science of how our thoughts and emotions affect our immune system. Mindset does matter! Negative thoughts increase inflammation, and meditation can be anti-inflammatory. This app helps beginners get started. If you think you can't meditate, this app will show you that you can. Entering to win is easy. In the the Rafflecopter box below, just answer two questions: (1) the country in which you live and (2) your favorite podcast episode. That’s it! If you want to follow me on Facebook, Instagram, iTunes, Pinterest, and/or Email, you’ll get all of my tips for autoimmune healing. But it’s not required at all. Good luck! The winners will be randomly chosen on March 23, 2018.